"It's another year for me and you, Another year with nothing to do"
Live At Red Rocks 8.15.95 (1997), Remember Two Things (1993), Live At Folsom Field, Boulder, Colorado (2002), Recently (1994), Live Trax Vol. 3: Hartford, CT August 27, 2000 (this album) (2005), Live Trax Vol. 13: St. Louis, MO June 7, 2008 (2008), Live Trax Vol. 12: Salem, OR May 5, 1995 (2008), Live Trax Vol. 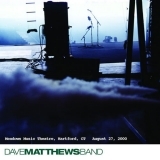 20: New York, NY August 19, 1993 (2011), Live Trax Vol. 21: San Diego, CA August 4, 1995 (2012), Live Trax Vol. 30: Nantucket, MA August 16-18, 1993 (2014).